Very clever and very low budget. Has anybody priced costumes in the store lately? Although this costume would probably be harder to make at home, I suspect the reaction from soused women would be similar to the wine spigot. Yeah, too much work. Do you have any idea how great it is to have you comment on posts like these? I’m not trying to be a hater, but does it work in places that don’t have Louisiana’s extremely generous open container laws? In other words, if you simply can’t give her the booze without the non trivial risk of being arrested, does it work? I LOVE the idea. Just not so sure how well it work outside the Bayou for legal reasons. God I miss getting my drinks to go. I’m assuming at any party environment (especially Halloween) she’ll be having a few. 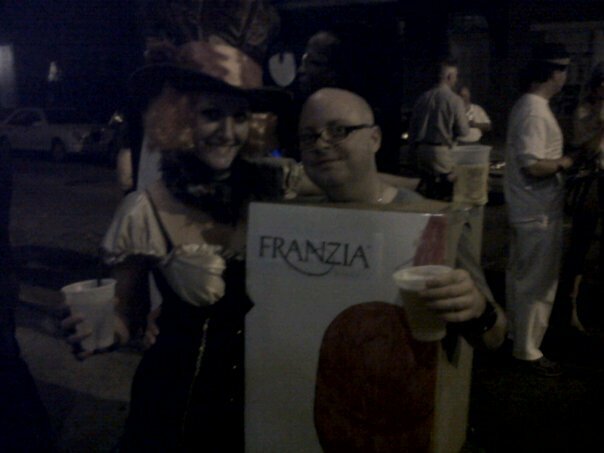 I’ve used this costume in Spain, and here in norf Florida. If you wanted a larger spigot to increase visibility, you could probably find a cheap pvc valve in the plumbing section of your local hardware store. Lol. I prefer anatomically correct. But good call. It’s not so much the visibility since the girls KNOW there’s a spigot. They just need an excuse to put their hands close to your mule.